Where to start? Well, I have a background as a machinist and tool maker, along with some wood working skills I have developed over the years. I have always worked with close tolerances and measurements. I live in Michigan about an hour drive north of Detroit. I have to update this,I used to drive a semi truck fulltime for a living but quit my job as a semi truck driver and am now making pipes fulltime. I attend 3-5 shows yearly now that I am making pipes fulltime, and may add more shows as the time allows me to attend. A friend of mine told me I should try to make a pipe, so I got a kit from Mark Tinsky, and tried it. I liked it alot, but didn't make another pipe for about a few months. Then I went on vacation up to the upper peninsula of Michigan and met up with Lee Von Erck. I had gotten about 10 blocks of briar from him, and had him drill out 2 of them for me while I was up there. The same friend, Scott Bundy,(who by the way has taken alot of my pictures of pipes for this site) wanted me to make him a pipe. 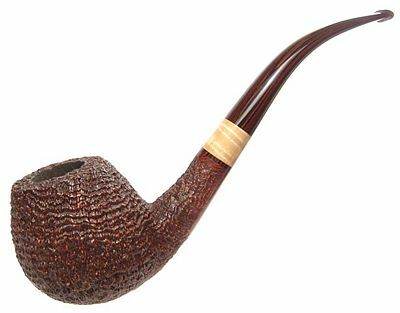 So I took the briar I had gotten from Lee and made him a pipe. He liked it and encouraged me to make more. In the mean time I was going into the IRC #pipes chat room and got alot of information from the guys that frequent the chat room on how to make a pipe. Alot of that information came from Dale Adkins and Robert Vacher. They taught me lots of tricks on how to make pipes. 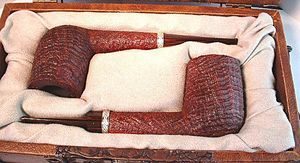 I also did alot of research on the net and read every bit of information that I could get my hands on about making pipes. 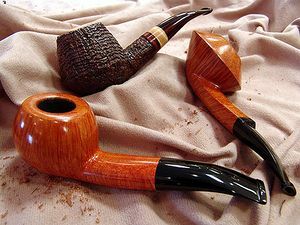 I made a few more pipes and entered my 4th, 5th, and 6th pipes I had ever made in to the Pipes and Tobacco magazine sponsored pipe carving contest. I placed second in the amateur carving contest, and that gave me lots of encouragement. I also got tons of information and knowledge at the Richmond pipe show, where the contest was held, from the many pipe makers at the show. Mike Lindner told me at that show that he would teach me to make hand cut stems. So I came home from the show and we got together and he showed me how to make hand cut stems. I will probably produce about 100-150 pipes a year. All high grade pipes. I use only the best plateau briar from Italy and Morocco . I also use the very best Ebonite and Cumberland rod stock that can be had, to hand cut all my stems. My pipes are drilled to 4mm in the draft hole in the shank, and are tapered in the stem to the button. Some draft holes are drilled larger, when the bowl is larger then 3/4" diameter. This makes for a very dry and cool smoke. The stem draft hole is also polished inside to make for a smooth surface so cleaning it, is extremely easy. This page was last edited on 2 August 2016, at 18:39.